I’m kind of a sucker for Asian style salads. 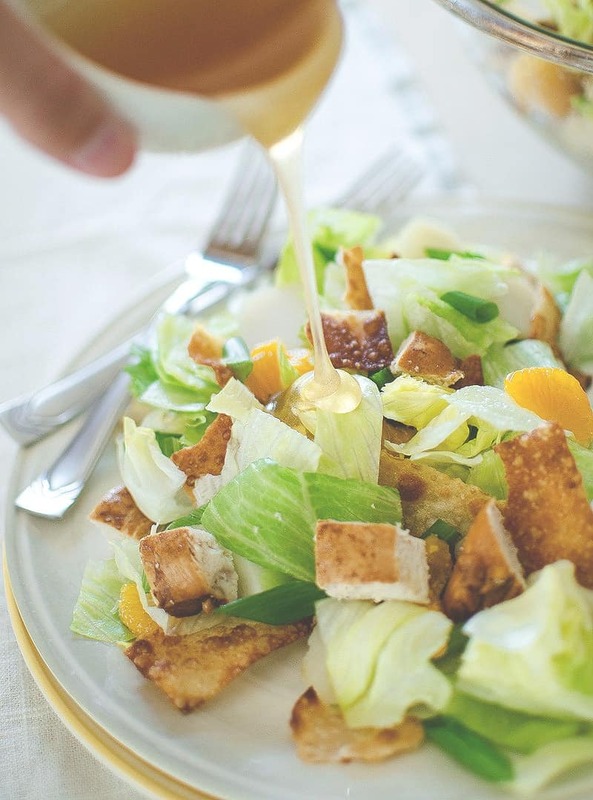 I love the sweet tangy dressings, as much as I love Ranch I can only have so many salads with just Ranch! Restaurant style Ranch though.. that’s a whole other story. On a typical salad for lunch my go to is EVOO and a little lemon juice. I’ve used various salad seasons from McCormick and love them as well (such as this Arugula Salad). This summer I post this Tropical Fusion Salad topped with some Grilled Asian Chicken. 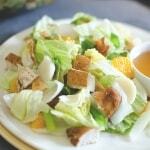 Well I’m using that chicken again but this Won Ton Chicken Salad has its own flavor and texture. 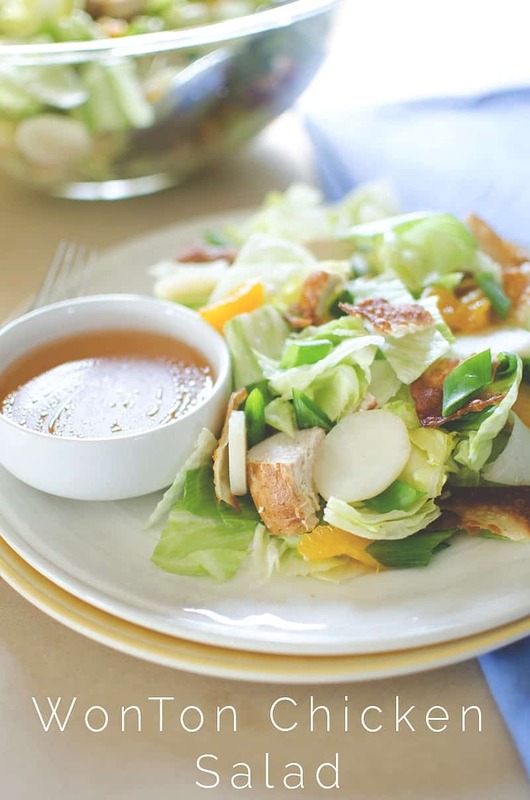 And truth be told.. this sweet Asian salad is pretty simple. Instead of the crunchy chow mien noodles, we use Won Tons. You can find Won Tons Wrappers in the refrigerated pasta section. Fry them up in a tiny bit of olive oil to make them nice and crisp. Watch them close, it literally takes seconds for these thin babies to fry. Once those are nice and golden, set aside to cool. Use the same pan to pop your chicken that’s been marinading. I add in the marinade as well to give the chicken some moisture. Cover and cook! This little scenario is the most difficult part of the entire salad. Seriously. 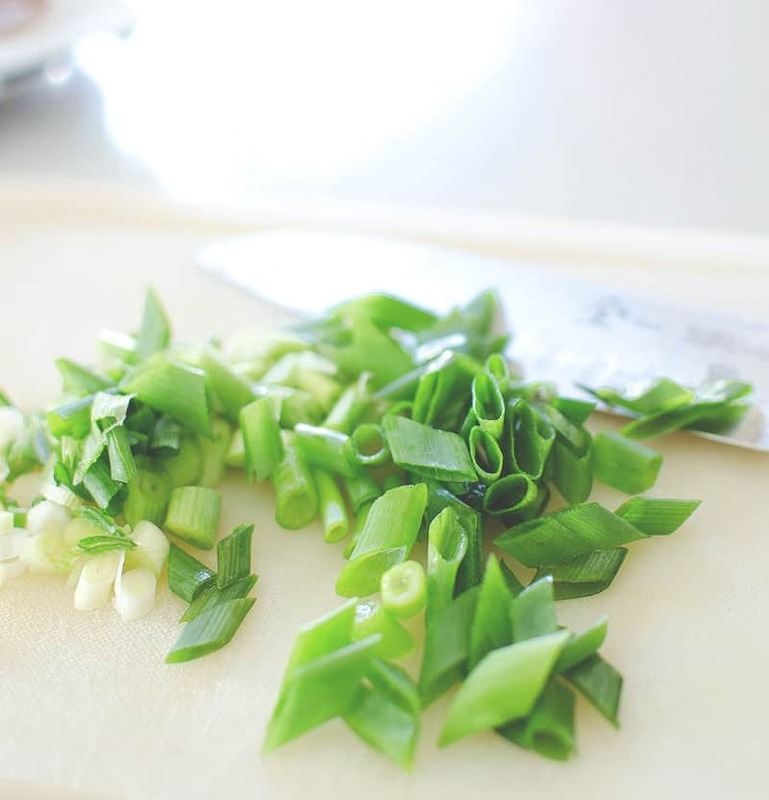 Wash and chop your salad and green onions. Toss with some crunchy water chestnuts and mandarin oranges for good sweet measure. For the Won Tons, just run your knife through them a few times and they will break to pieces. I prefer them a little larger. Chop the chicken, whisk up your salad dressing and you are ready! My only word of caution is to wait until just before serving to add the dressing. 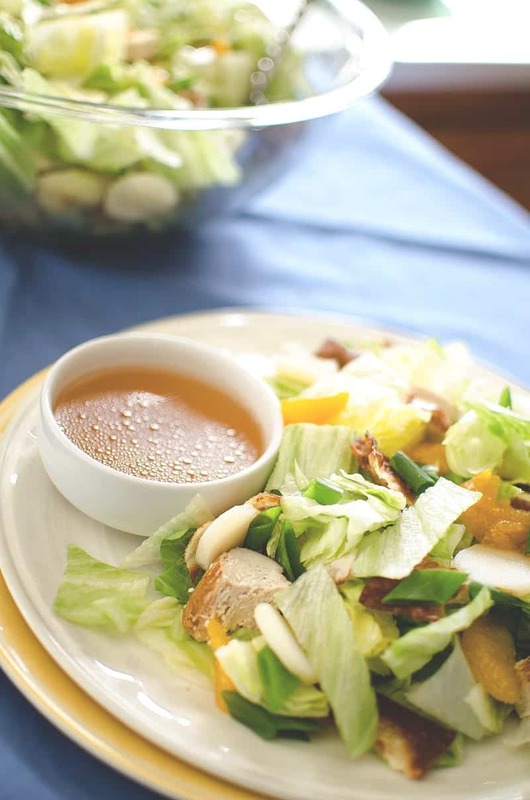 You don’t want the Won Tons to get soggy from the dressing. P.S. This is totally a party-sized salad. Makes a huge bowl to serve your posse. A crunchy Asian adventure for your mouth. 1 small can of Mandarin Oranges drained. Place chicken in a large ziplock with marinade of choice. Allow to marinate at least 30 mins. In a large shallow pan heat olive oil to medium-high heat. Add in a few Won Ton wrappers a few at a time. Fry till golden on each side (just a few seconds). 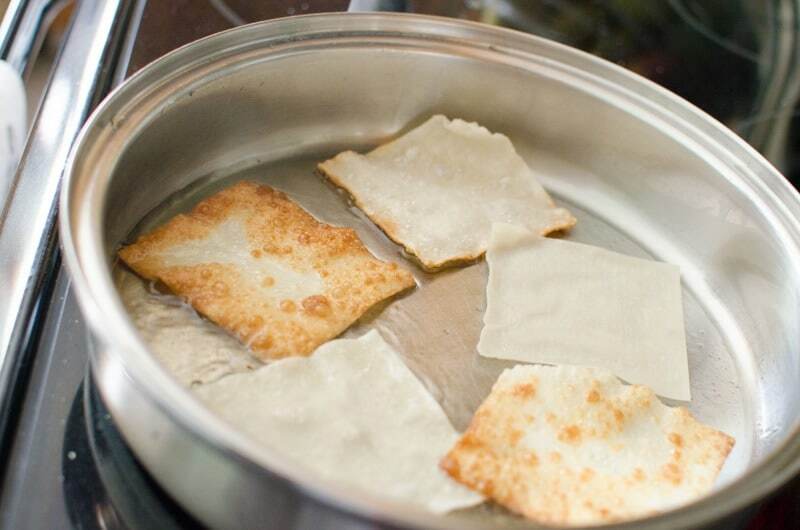 When done place on a paper towel to cool. In the same pan, add in chicken with marinade. Cover and cook through, turning chicken once. 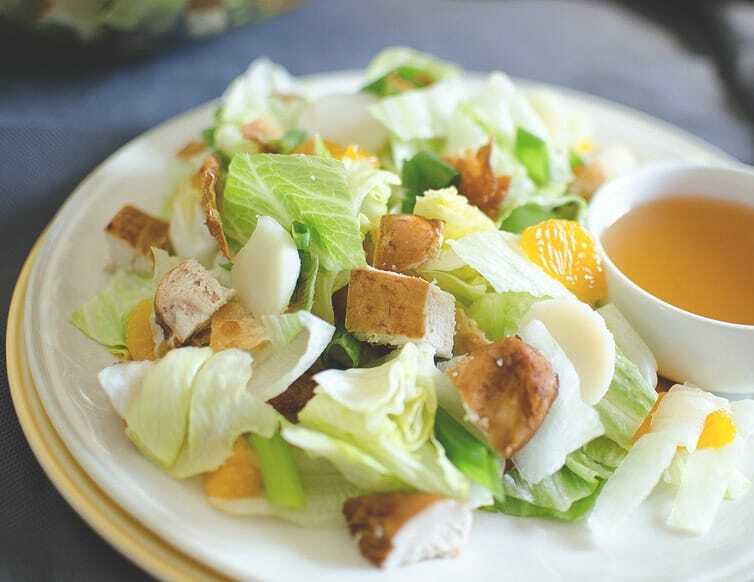 While chicken is cooking, prepare salad by washing and chopping lettuce and green onions. Run your knife through the Won Tons a few times to make large crispy pieces. When chicken is done, allow to cool and cut into bite sized pieces. Toss everything together and cover with dressing when ready to serve! Whisk together vinegar, sugar, salt, and soy sauce until dissolved. Continue whisking and slowly add in peanut oil to form an emulsion. Salad can be prepped ahead of time. Toss Won Tons and dressing with salad when ready to serve.